Well, the temperature has dropped to below zero here on quite a few occasions lately. It was -14 when I woke up yesterday morning. Which means winter is in full effect, my nails and skin are suffering from the extreme cold and Christmas is just around the corner. 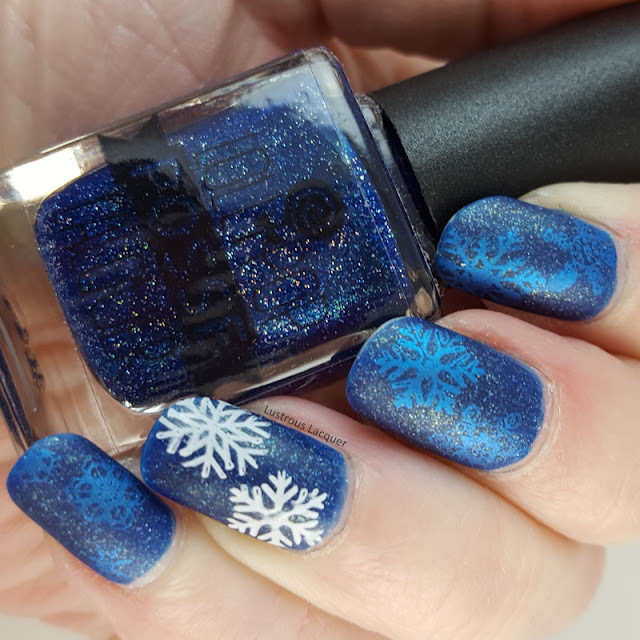 That means it's time to break out some seasonally inspired manicures! 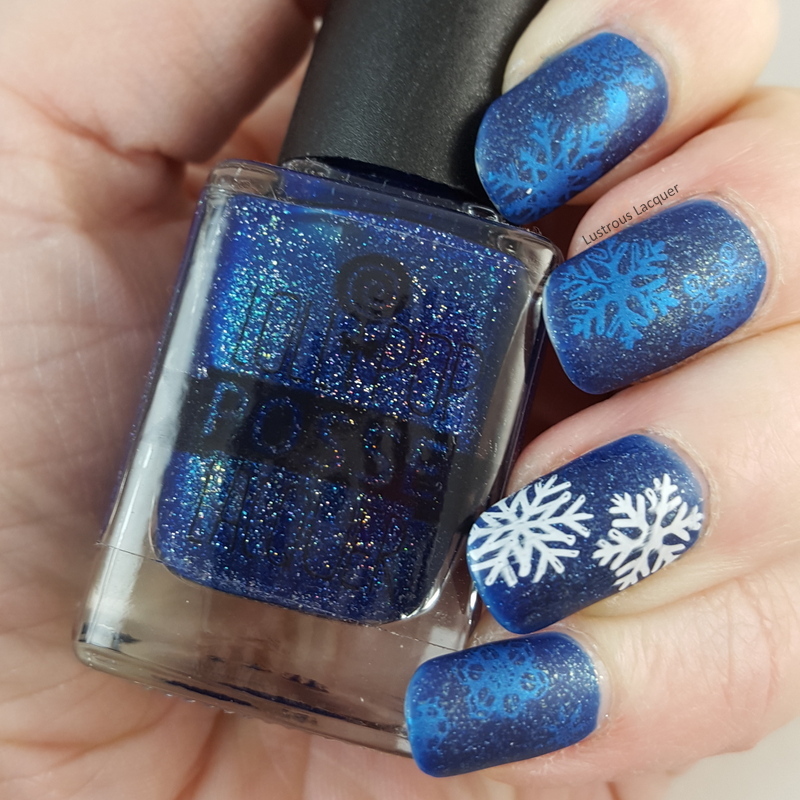 I thought with the severe cold and snow predicted to hit my area over the weekend it was only fitting to share with you the frozen snowflakes manicure I wore this week. With there still being 10 days left until Christmas I wanted to steer away from the traditional colors, and go with something wintery instead. 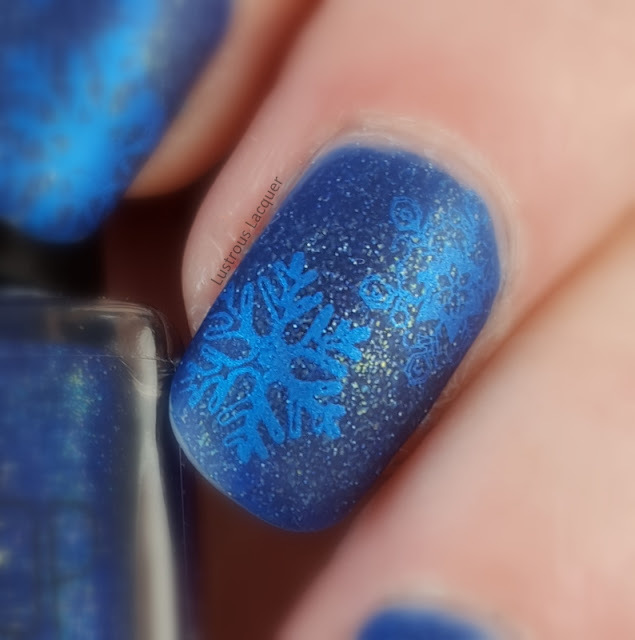 And I honestly thought this might be an original idea with the blue snowflakes stamped on a blue base but they are all over Pinterest right now. I'm not sure if I saw one and didn't completely remember it, or if I've finally been on trend with my manicure! I started with a base of Lollipop Posse Slipping out of time, a Catalina blue nail polish with holographic flakes. 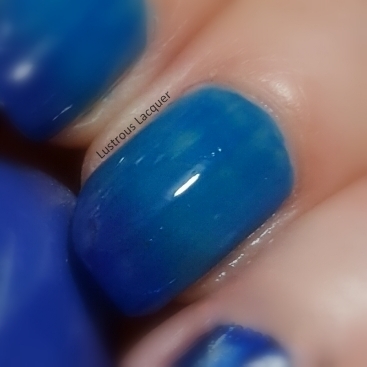 Then I mattified it because let's be honest I don't use my matte top coat as often as I should. And maybe because I thought the holographic flakes would look really cool that way. For stamping polishes, I used Snowed In and Blue-tiful from Hit the Bottle and really like how it turned out. The blue wasn't quite as easy to see as it looks here which was kind of a bummer at first but as the week went on I really liked the subtleness. Well, that's all I've got for you today. I hope you enjoy your weekend and for those of you in the colder climates, I hope you stay warm. Thanks for stopping by and Happy Polishing! 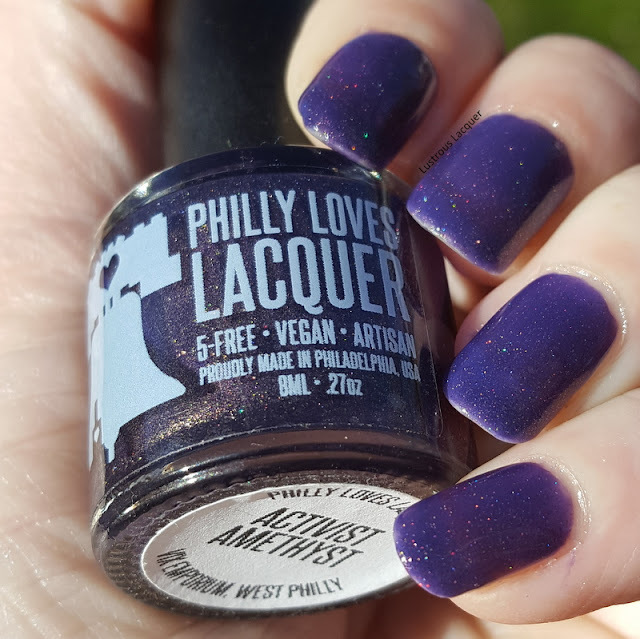 Today I have for you 3 polishes released this fall from Philly Loves Lacquer's West Philly Collection. Sadly just after this collection was released the announcement was made that she was closing up shop. 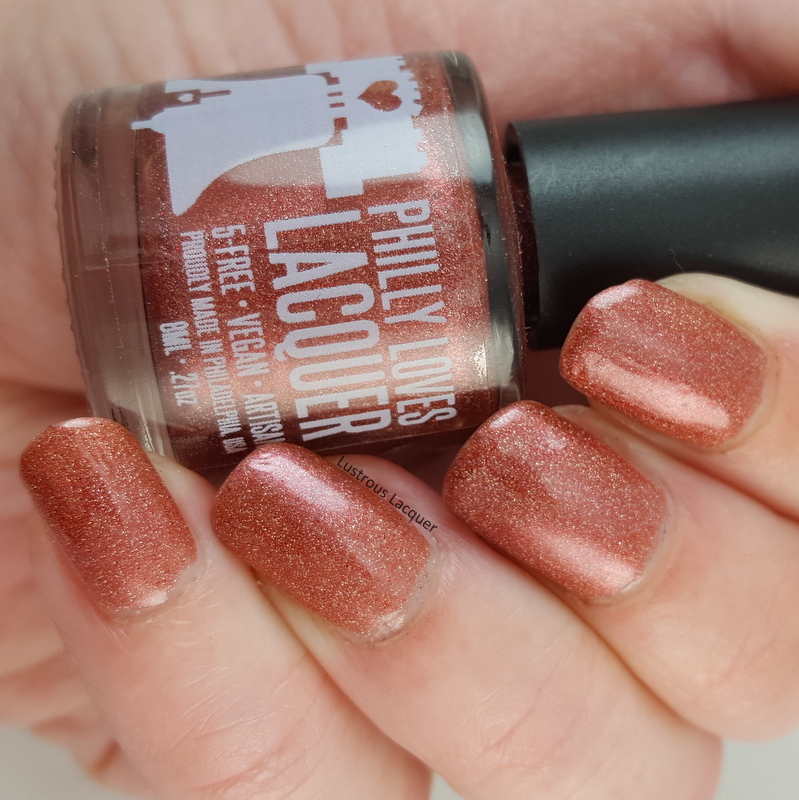 I'd already swatched these polishes and hemmed and hawed about actually featuring them on the blog. In the end, I decided they were too pretty not to share and I was able to purchase them with a blogger discount with the intent that I blogged them and needed to keep my word. Because they are no longer available for purchase and I have a lot of pictures I'm going to keep things short and sweet. Enjoy! 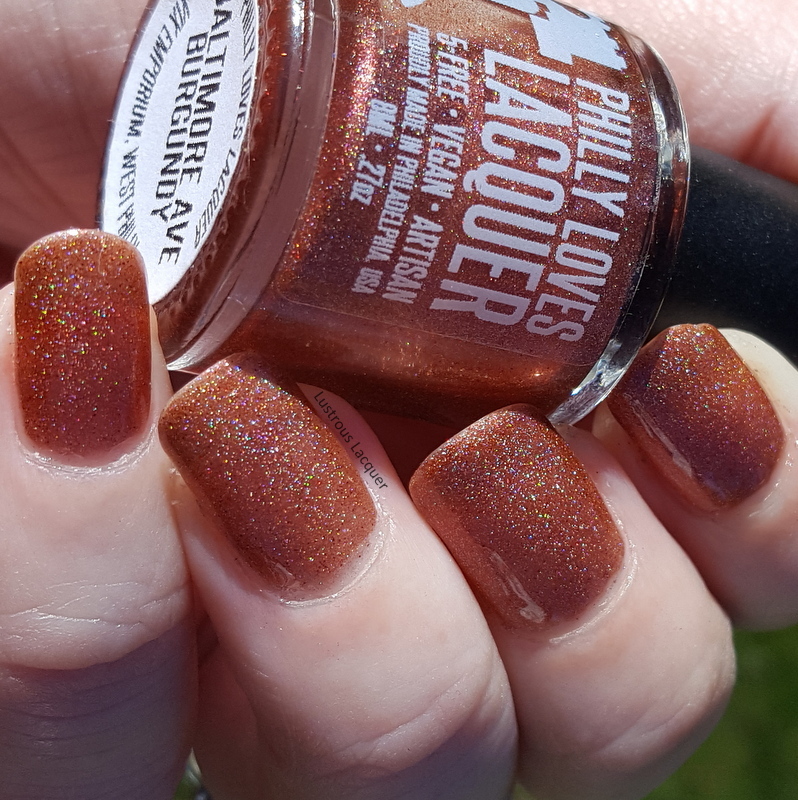 Color: Copper colored linear holographic nail polish. 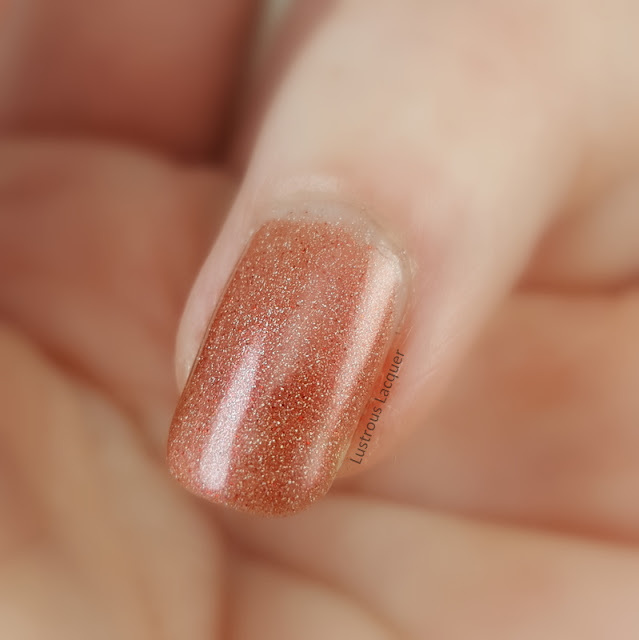 While in Direct lighting this polish leans a slightly more pink and pulls more orange in indirect lighting. Finish: Dries to a glossy finish with just a hint of texture. Application: Smooth even coverage with a slight VNL after 1 coat. Builds up nicely after 2 coats. Overall this polishes has a nice sparkle to it, but only a subtle holo flare. And I have to say I really like it. Color: Bright grass green scattered holographic nail polish. Application: Smooth even coverage but a little sheer. Still shows slight VNL after 2 coats. Overall I expected this polish to be more opaque base off how it looks in the bottle. 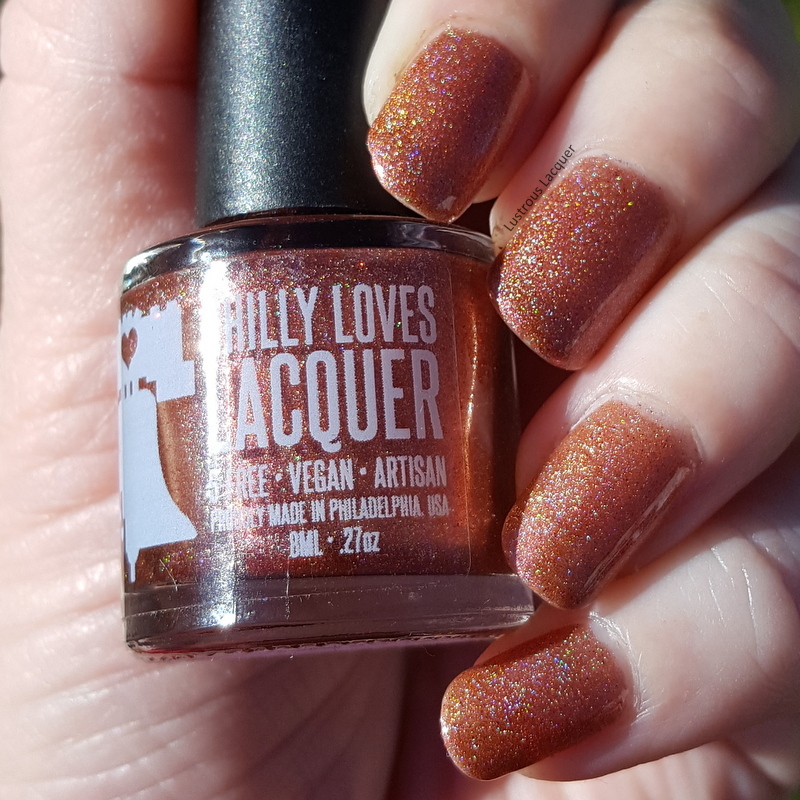 I do like that it has a stronger holographic flash than Baltimore Ave Burgundy, but it's still not as sparkly or as flashy as other nail polishes in my collection. 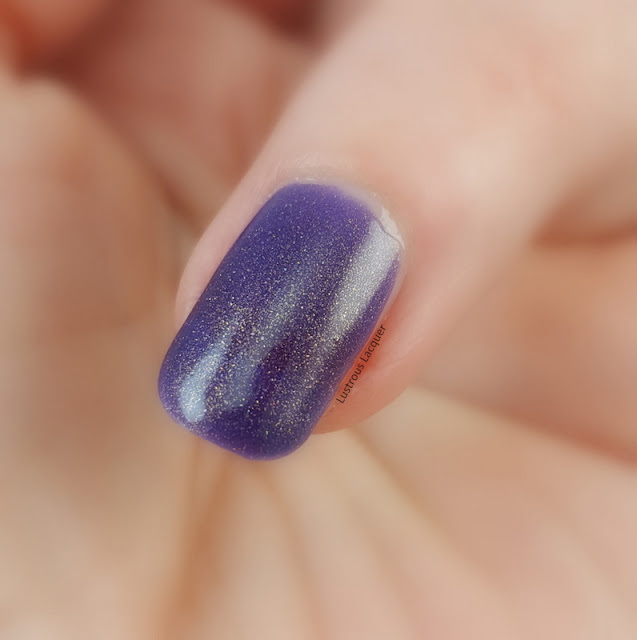 I'd say it's a suitably understated holo. Also, I'm not really a big fan of green nail polish but I do like the color of this one, and just might wear it again. 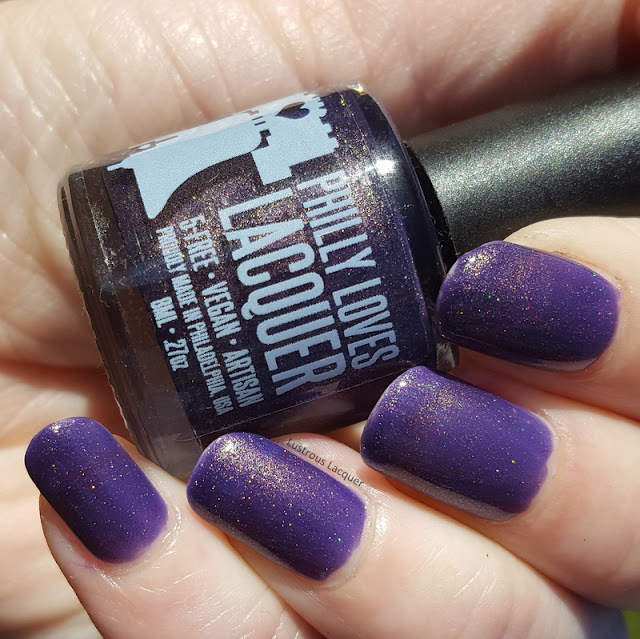 Color: Deep purple scattered holographic nail polish with a sprinkling of golden shimmer. Application: A tad streaky and sheer on the first coat. Built up nice and evenly after 2 coats. Application issues aside I like the deep vampy feel to this color and feel it transitions nicely from fall to winter. 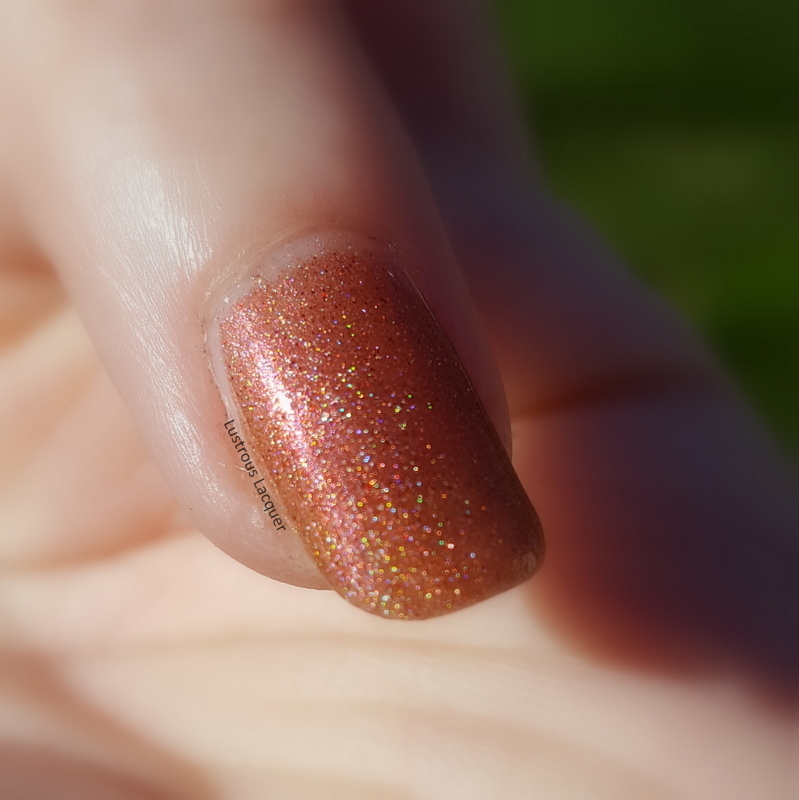 When looking at my nails I saw more of the golden shimmer than the holo. 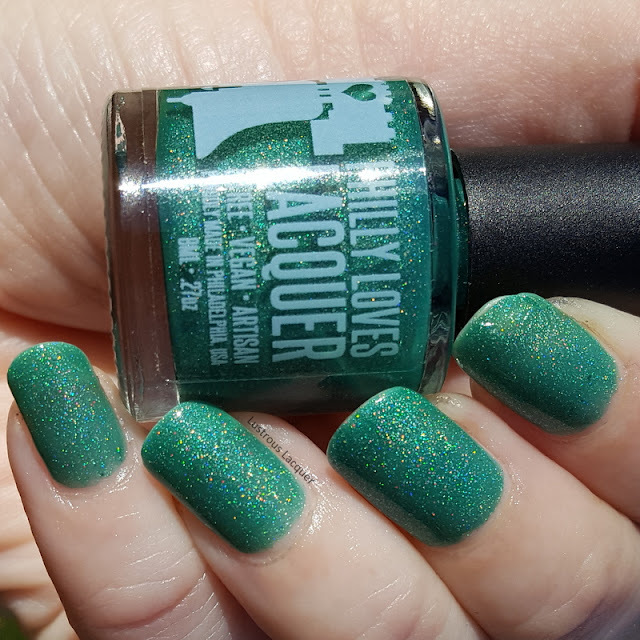 And it does have the least amount of holographic flash of the 3 polishes shown here today but it's still a gorgeous color. I hope you enjoyed today's post. If you picked up any nail polishes from this collection let me know which ones in the comments. Thanks for stopping by and Happy Polishing! There's a famous saying that goes "You get what you pay for." And while that is usually true, every once in a while a product comes along and changes all that. Today I will be sharing with you one of those products. 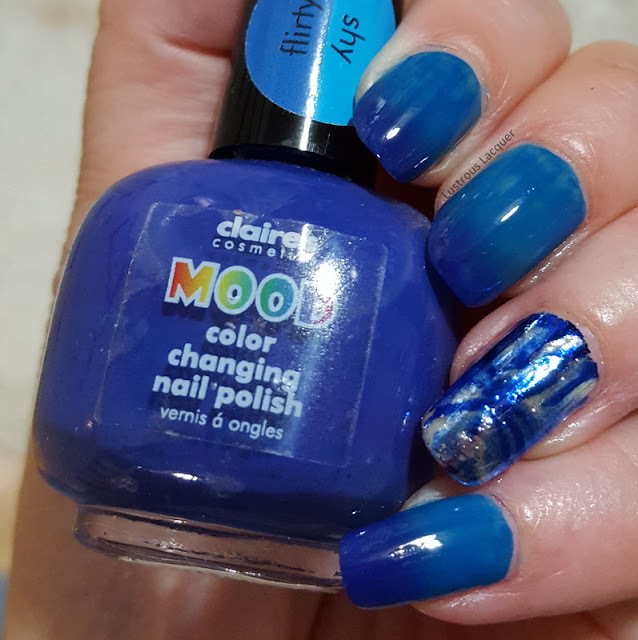 Claire's nail polishes are some of the most wallet friendly polishes you can buy and are available in almost every mall across the country. 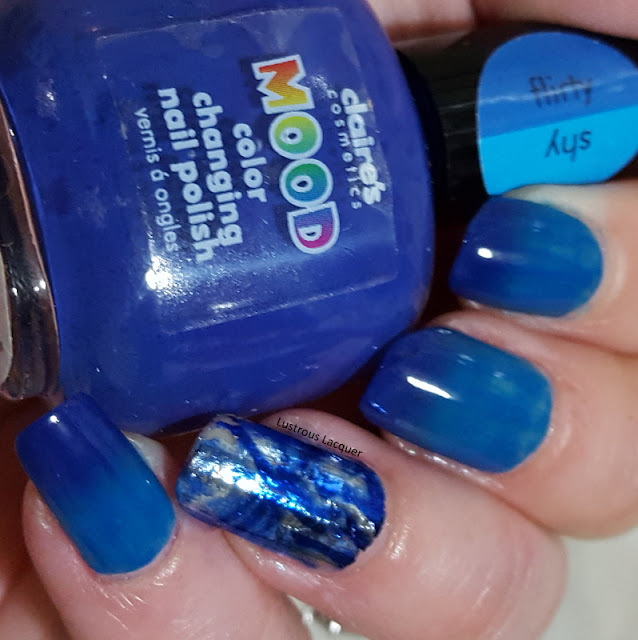 So Imagine my surprise when the 3-year-old bottle of Mood polish my daughter chose for me to wear still shifted colors. And I don't mean just a slight shift during extreme temperature changes, but a very noticeable shift as I was painting my nails! The formula of Flirty and Shy sadly was not as friendly as it's price tag. My bottle was thin and runny with a lot of streaking no matter how much I tried to remix my bottle. Now this could be a factor of its age and not the original formula, but I guess I won't know that for sure unless I pick up another bottle. Flirty and Shy dries extremely quickly to a matte finish and for me, the color shift was almost instantaneous. Shown here is 2 coats plus top coat. For an accent nail, my daughter decided I needed to break out my nail foils and picked the Azurit design from Dollar Nail Art. Of course, if you've used nail foils before you know that a regular top coat ruins the foils, and a water based one is needed. 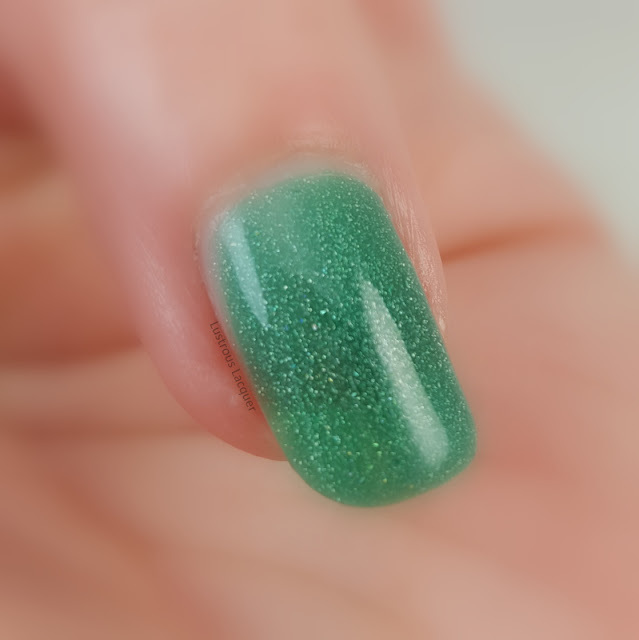 The only water based top coat I've tried is Sprout although Id love to hear your suggestion for a different option. Thanks for stopping by and Happy Polishing! 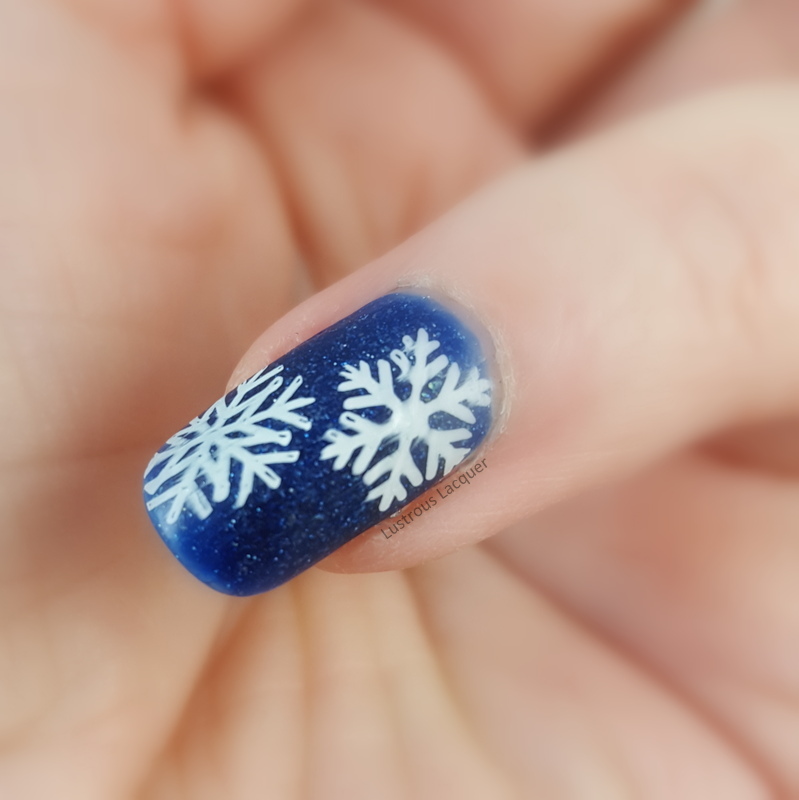 Today I'm going to share with you my first attempt at double stamping. This is a look that I've seen people do numerous times and have always wanted to try. The thing that held me back was my inability to place images on my nail in the positions that I wanted. 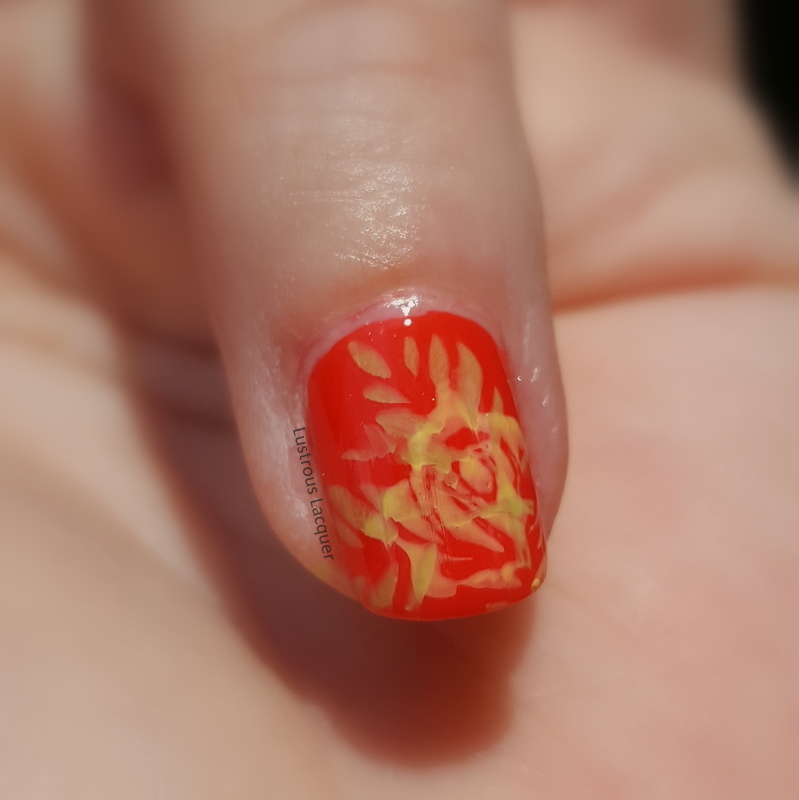 Well, the invention of the clear stamper changed all that and I decided to give this look a try. For those of you who are in the same situation, I highly recommend checking out the clear stamper options out there, to see which one would be the best fit for you. I am currently loving the Monocle stamper from Bundle Monster. It has a larger stamping surface than the original clear jelly stamper and is shorter. I like that because it's easier than staring down the skinny tube. And after writing those last few sentences, I've come up with the idea of showing and comparing those stampers so look out for that in the coming new year. 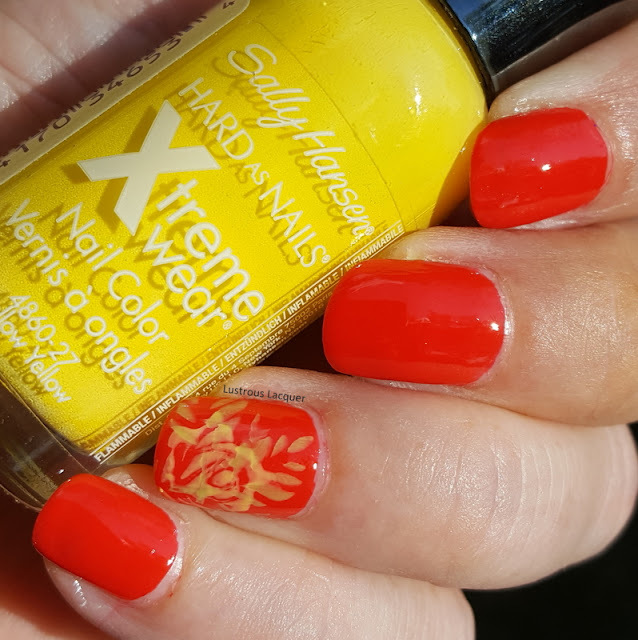 For this look, I started with a base of Orly Terracotta, a vibrant coral polish. 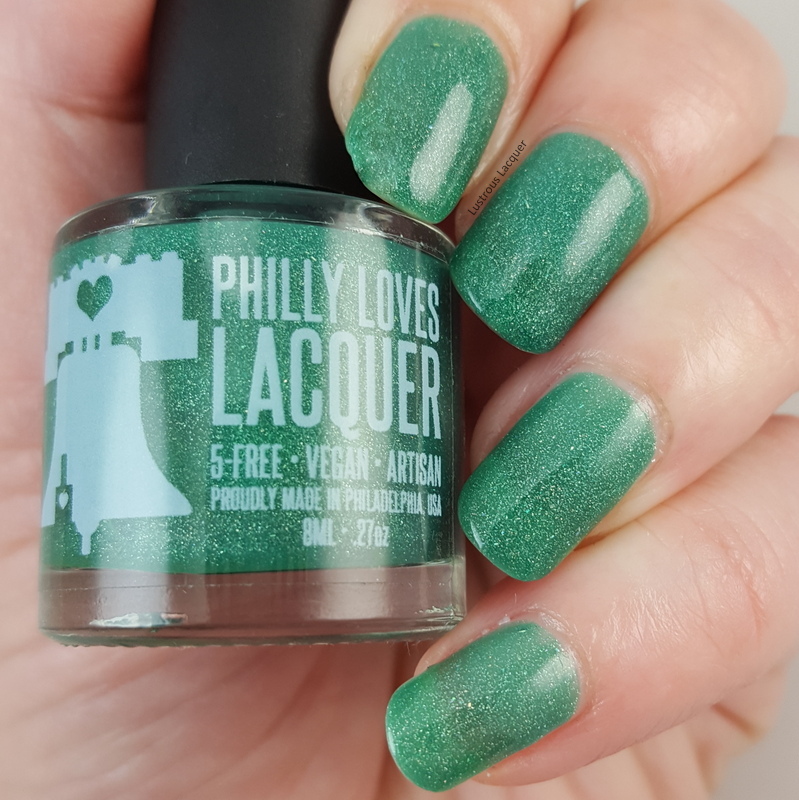 Using Red Angel plate RA-116 I stamped my leaves with Sally Hansen Green with Envy. 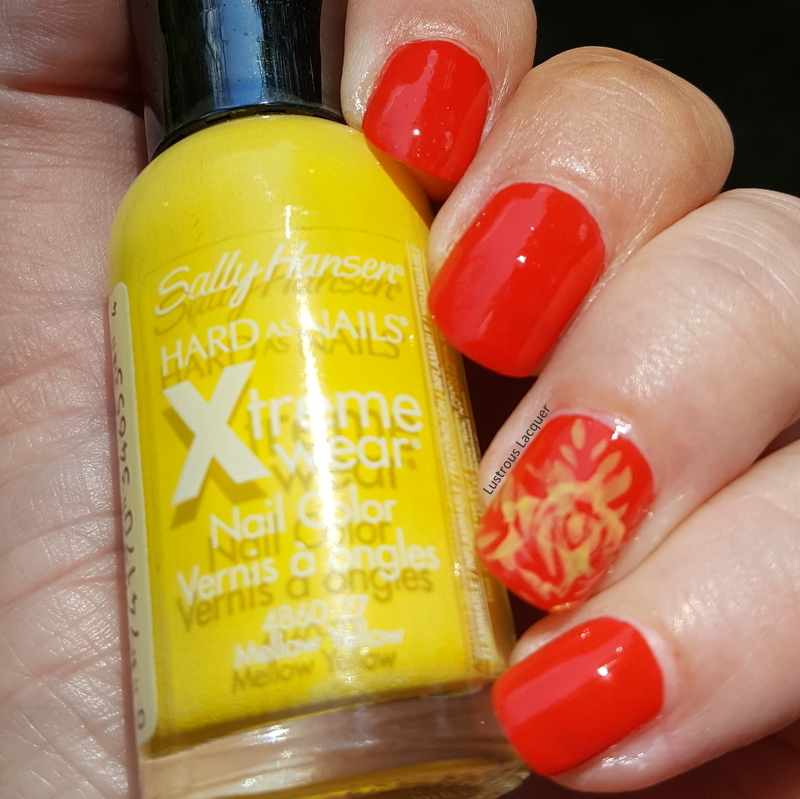 From the same Red Angle plate, I went in and added roses with Sally Hansen Mellow Yellow. It didn't create quite as much contrast as I was hoping for, but I do like the feel it created. 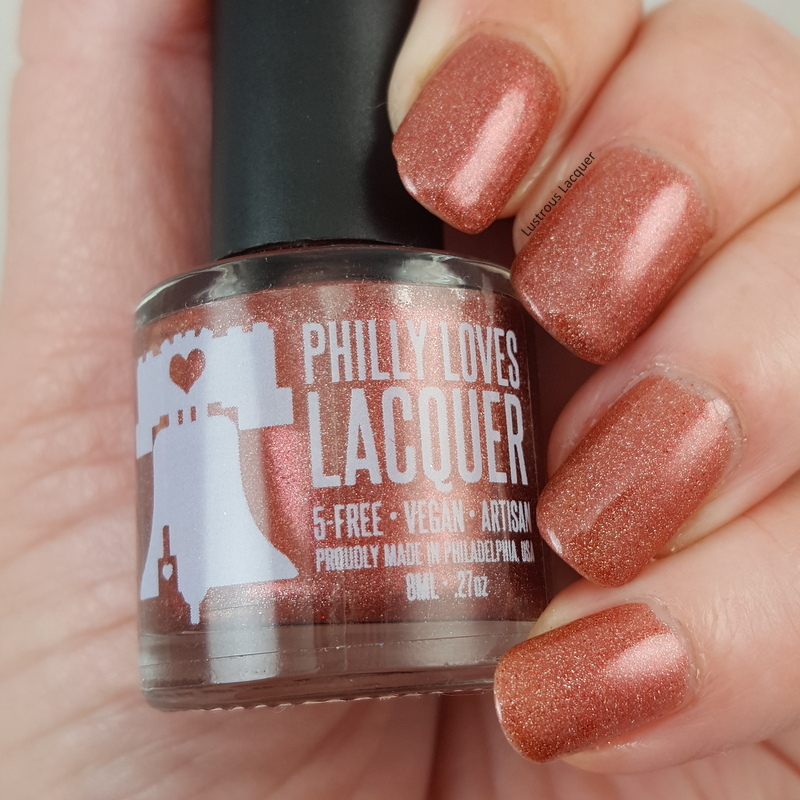 There was just something about the rich coral color that screamed tropical oasis to me, and I was in the mood to wear something fun on my nails. 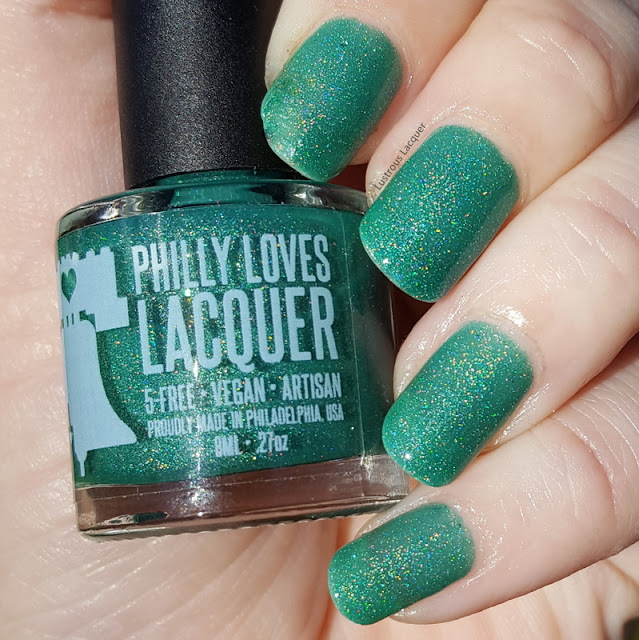 The muted tone of the stamping helped it keep this from heading in the wild tropical vacation direction and stick with the private island getaway I wanted. I hope you enjoyed today's look, let me know what you think in the comments. As always thanks for stopping by and Happy Polishing! 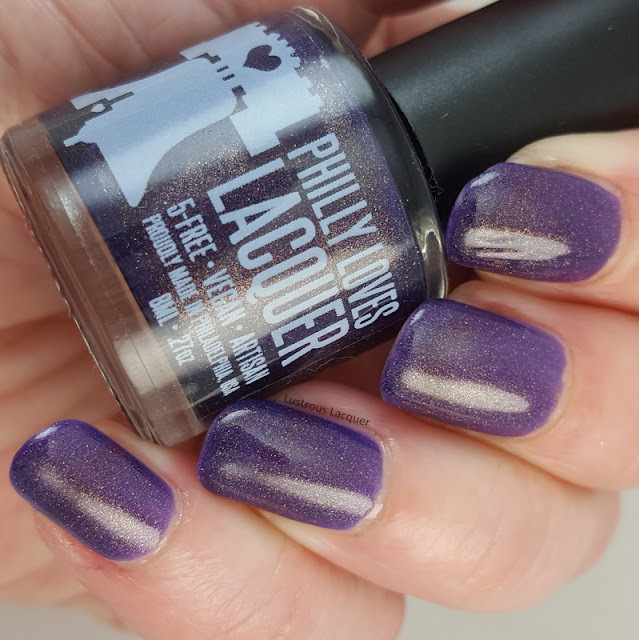 My goal is to have a comprehensive list of every collection OPI has released over the years. This will be an ongoing post as I research previous collections and new collections are released. If you know of a collection I'm missing or see an error please let me know by leaving a comment or sending me an e-mail. Orange You From New York? Hey Vito, Is My Car Red-Y? Lighten Up, You’re Two Pence! Don’t Wine… Yukon Do It! My Paprika Is Hotter Thank Yours! WHO ARE YOU CALLING BOSSY?! 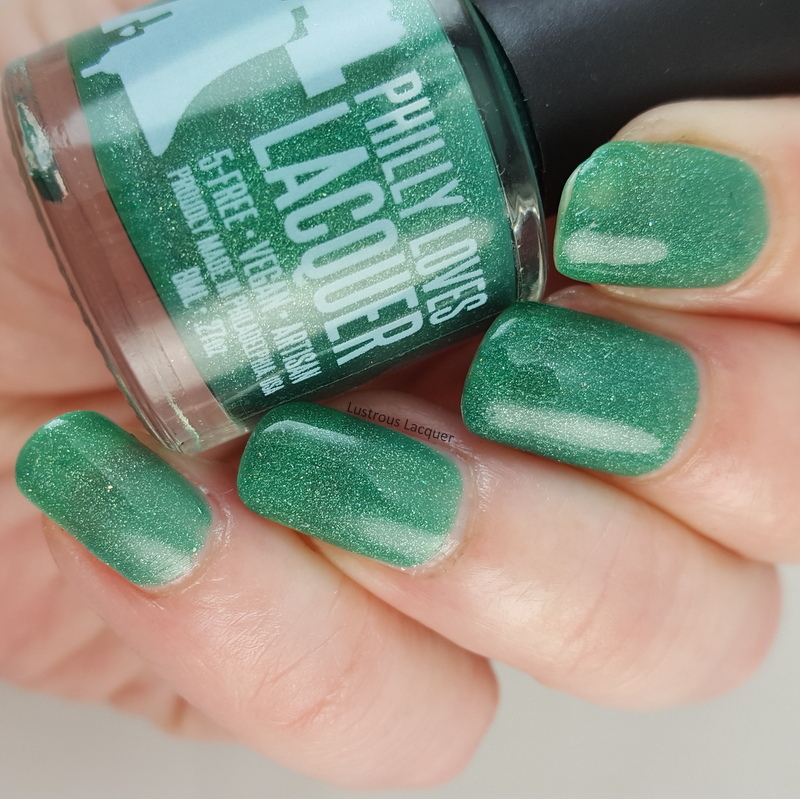 One Heckle of a Color! Adam said, "It's New Year's, Eve"